Do I really need Stair Nosing? 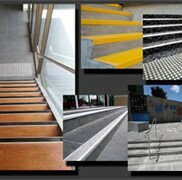 Stair nosing is a section of anti slip product placed at the toe contact area of a stair tread. It should always be placed in a specific position providing a secure contact point for the toe when climbing or descending. It should always contrast the stair tread to ensure good visibility for the visually impaired or in poorly lit locations, some of the inserts for these darker stairs even feature phosphorescent inserts that glow in the dark. 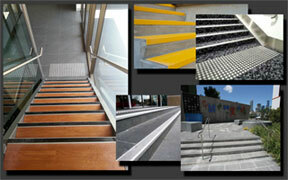 Stair nosing is available for use indoors and outdoors and choosing the correct type will ensure long term safety. The nosing itself can be made from Aluminum with an anti-slip insert strip, typically used in Commercial environments where aesthetics are an important consideration. New construction unless exempt has to meet code and stair nosing is simply required. You need to select a stair nosing that is durable, slip resistant, retains attractive appearance even in high traffic stairways but the most important feature is it MUST meet the relevant construction code. A stairway is defined as 2 or more steps used in pedestrian travel. • Must have a luminance contrast of at least 30% when set against the stair tread surface. • If a contrast strip is used as an insert the strip must be between 50mm and 75mm wide and cannot be set back from the tread/riser intersection by more than 15mm. 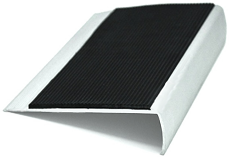 • When located at the front of a stair nosing, the contrast strip cannot extend down the riser more than 10mm. Although there has been some debate about the front edge drop most manufacturers will supply 10mm or 25mm. In some cases the nosing profile base itself has a 30% variance to the stair surface and so becomes in effect a part of the contrast strip. 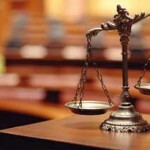 The owner or property manager has a duty of care to ensure that people within his premises do not get involved in an accident as a result of his negligence. Safety stair nosing is one of the effective tools that can be used by a builder, landlord or property manager to prevent slip and fall. If a slip and fall accident occurs when a property manager or owner has done everything within his control to avoid it, then he unlikely to be held liable in such an accident. 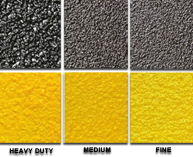 Choosing the correct Stair Nosing is critical and you should always speak to a professional before selecting or installing stair nosing to ensure you meet these codes and make your stairs safe. If you would like further information on stair safety or compliance requirements contact us at Friction Systems Australia.